MARE ISLAND, Calif. -- Make a wrong turn in this ghost town that was once a naval base and finding Mare Island Golf Course can become as difficult as mastering the tricky layout at this former nine-hole course that grew to 18 holes three years ago. "We have a lot of golfers call us and say they can't find the course," admits Aaron Walker, Mare Island's director of golf. There's good news to report, however. Even with a few missed turns, the tour of the now mostly deserted Mare Island Naval Yard is an interesting journey into the Bay Area's wartime past. 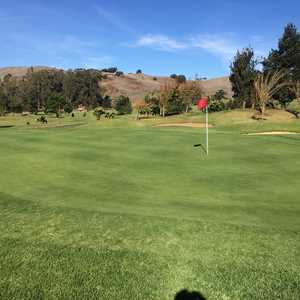 Playing this inexpensive course, located 34 miles from San Francisco, is a treat as well. Mare Island on the western edge of Vallejo was quite the place in its day. It was once the largest single industrial plant west of the Mississippi and in its prime was home base for 46,000 service people. At one point this shipyard on San Pablo Bay was responsible for repairing the entire Pacific fleet. But Mare Island was shut down in 1993 when the military pulled out, leaving something of a ghost town behind. Certainly as various military bases have closed in Northern California, golfers have benefited. 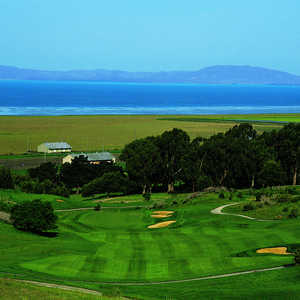 Two highly touted military courses at Fort Ord (Bayonet and Blackhorse) have been added to the Monterey golfing scene. Sacramento gained two courses when McClellan and Mather Air Force Bases were shelved. At Mare Island, the course used by the military had only nine holes, which were in poor condition. Then acclaimed designer Robin Nelson of nearby Mill Valley entered the scene and the course's lousy reputation eventually changed. The Nelson & Haworth design team won four awards in 2001 for the Shan-Shui Golf & Country Club, including best golf course in Asia. That was just one year after Nelson had finished the back nine at Mare Island. He's also won acclaim as the designer of the Dragon at the Nakoma Resort in Graeagle near Tahoe. Nelson put together a nice group of new holes on the backside here, where concrete bunkers and a bomb shelter were once part of the ammunition dump. The front nine was improved as well. "The original owner (Wayne Pierce) was lucky to get Robin," Walker said. "The course had no real style to it, but he made it real unique." Besides doing the back nine, Nelson redesigned No. 4, previously a par-3 that was converted to a short par-4 (289 yards) that offers some different strategies for attacking it. For fans of using different strategies, Mare Island offers plenty of decisions to make. The course is short by modern standards, measuring just 6,150 yards from the tips. Yet considering the unpredictable and ever-present wind, holes play much longer at times. Hitting a 5-iron from 130 yards is not that uncommon. Many par-4s are short and don't require a driver. Some don't even require a wood, depending on how long you hit your irons. And the challenge, especially on the tree-lined front side, is sticking those irons on the tiny, pie-shaped greens. How tough can Mare Island get? The course record is a two-under 68. Once on the greens, putting can be tricky due to subtle breaks. The good news is these formerly bumpy greens roll a lot better than they actually look. "The greens are fairly fast and roll very true," said Gary McDonald of Concord, a first-time visitor to Mare Island in early July. Looking for a new spot to play on the weekend, McDonald and Fairfield buddy Evan Anwyl decided to try Mare Island. They were amazed at the cheap weekend prices ($38 walking, $48 riding), the fabulous cool weather (around 75 degrees) and the course's unique terrain. "This is a well-kept secret, I think I just found my new favorite course," Anwyl said. "I'll be back, particularly during the week when I can play for $14 at twilight." Paying steep green fees is common around the Bay Area. New courses like Hiddenbrooke in Vallejo, Roddy Ranch in Antioch and Stonetree in Novato have much steeper price tags. Walker says he believes the competition for golfers has forced individual courses to improve. And that means whatever it takes, whether it's lowering the green fees a bit or improving the course. 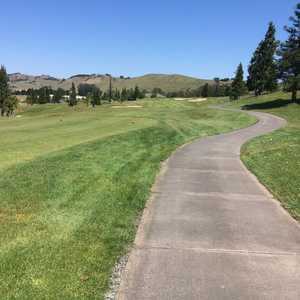 One example is Foxtail Golf Club in Rohnert Park that decided to revamp its course with that in mind. A 36-hole facility that was formerly Mountain Shadows, the club did a huge renovation on the north course and reopened last May. The new look added length, more fairway bunkers and many other subtle changes. That resulted in a tougher course. "Our layout is awesome now," said Foxtail shop assistant Dan Lithgow. "We overhauled the north course and gave the south course a minor tune-up, working mostly on the greens. We're a muni course that's not too expensive. We're where the average guy is coming." Considering its improvements, there may be more rounds in Mare Island's future as well. What's not to like? The price is right, the course is challenging and even weekend rounds during non prime-time go quickly. Actually, there are some negatives. There is only one par-5, coming at the fifth hole. No woods are allowed on the driving range, the clubhouse is badly outdated, and typically no-cart person circles the course with refreshments. Still, consider the weather and the views, which are numerous. Although water comes into play on only a few holes, there are panoramic views of the San Pablo Bay throughout the course, plus Mount Tamalpais in the distance as well. There are not a lot of quality choices in Vallejo. But a decent selection might be the Best Western Marine World Inn. A Six Flags theme park, a good idea might be to drop the kids and wife off at Marine World and have everyone meet back at the room at the end of the day. Free shuttles are provided to the park, and packages that include admission are available. A complimentary continental breakfast is provided. Call (707) 554-9655 for more information. Only 34 miles away is San Francisco, where lodging and restaurant choices are numerous. Wine tasting in Napa is not a long drive, either. Again, the choices in Vallejo are not numerous. For a quick Italian dinner, try Napoli Pizza, which is just down the street from the Mare Island entrance at 124 Tennesee St.